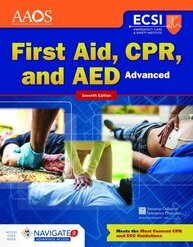 **Now with FREE access to First Aid, CPR, and AED Interactive, Seventh Edition! This manual is developed for use within advanced first aid, CPR, and AED training courses offered through Emergency Care & Safety Institute. Coverage of the 2015 CPR and ECC Guidelines: Clear, concise direction on how to perform CPR and use an AED during an emergency. New and updated content on the use of hemostatic dressings, application of tourniquets, administering epinephrine, dental care, and more. Navigate 2 Advantage Access unlocks an interactive eBook and student practice activities and assessments. A unique Access Code is included with each new print student manual.